← Zucchini Shakshuka (North African-Style Egg Dish) with Feta. Preheat a sauté pan over medium heat. While the pan heats up, trim off and discard the ends of the onion and remove the outer layer; small dice the onion (cut into ¼-inch pieces). Once the pan is hot, add olive oil and swirl to coat the bottom. Add the onion to the pan; cook, stirring frequently, until slightly softened, 3 to 4 minutes. While the onion cooks, trim off and discard the ends of the zucchini; halve the zucchini lengthwise, then cut the halves crosswise into ¼-inch-thick half-rounds at an angle. Add the zucchini to the pan and season with salt and pepper; cook, stirring occasionally, until softened, 4 to 5 minutes. While the zucchini cooks, trim off and discard the root end of the garlic; peel and mince or press the garlic. Add the minced garlic, paprika, and cumin to the pan; cook, stirring, until fragrant, 15 to 30 seconds. Add the tomatoes to the pan and stir to combine; simmer for 5 to 6 minutes. While the tomatoes simmer, using a knife, shave the parsley leaves off the stems at a downward angle, working away from your body; discard the stems and finely chop the leaves. Stir about ¾ of the parsley into the tomato mixture (save the rest for garnishing); stir to combine. Break the eggs into the saucepan. Reduce the heat to low and cover the pan; cook until the egg whites are set and the yolks are still runny, 5 to 7 minutes. 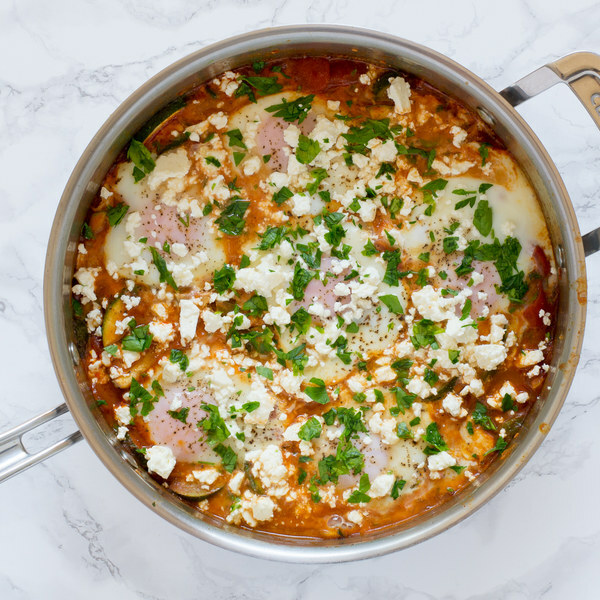 Uncover the pan and garnish the shakshuka with feta and the remaining parsley. To serve, divide the shakshuka between plates. Enjoy!